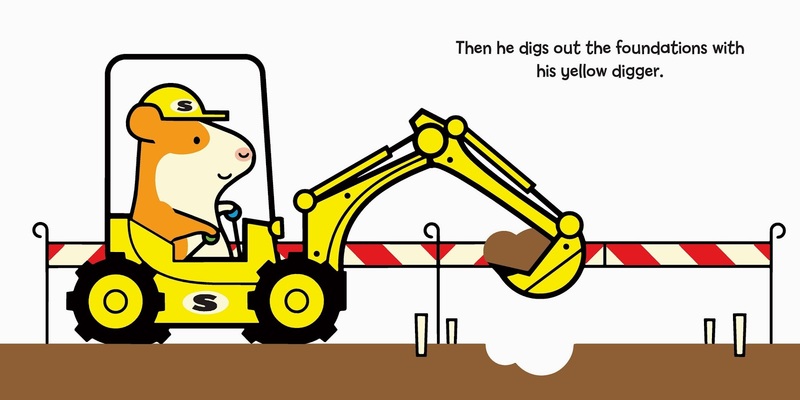 In this delightful new picture book series from British author and illustrator William Bee, Stanley the hamster is very busy--building houses, working at a garage, even running a farm. 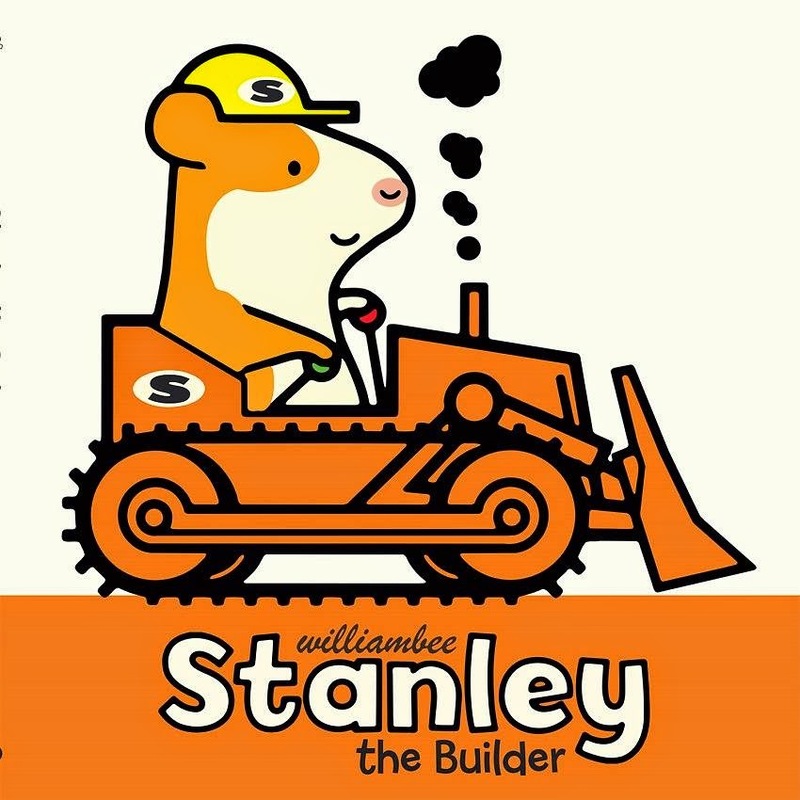 In Stanley the Builder, Stanley is building a house for his friend Myrtle the mouse. He'll need his orange bulldozer, his yellow digger, and his green crane. 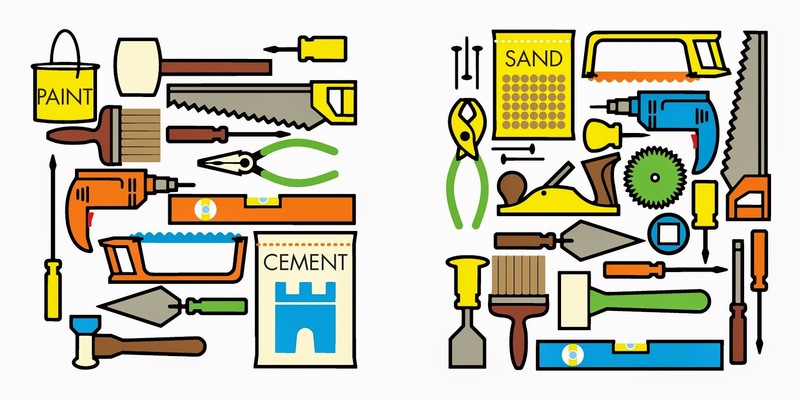 Step by step, he prepares the land and then builds the house. Together with his friend Charlie, he finishes the project by painting the house in Myrtle's favorite colors--red, white, and blue--before returning home for supper, a bath, and bedtime. In this series, Bee uses very simple vocabulary and minimal text together with very appealing digitally-created images to craft a story that is equally appropriate for two distinct audiences: toddlers/preschoolers and beginning readers. There are so many things to like about this book, but first and foremost are the illustrations, with their clean black outlines, flat bright colors, and simple shapes (not to mention adorable hamsters...) Bee's U.S. publisher for this series, Peachtree Publishers, has kindly provided some artwork so The Fourth Musketeer's readers can get a better sense for Bee's unique artistic style. I was especially interested to note that Bee trained as a designer (check out his quirky website, which gives little information on his books but tells you all sorts of interesting trivia about his passions for vintage cars and the Queen). His design flair can be seen in everything from the endpapers (see first image below) to the font chosen for the text. While this series is a sure-fire winner with toddlers and preschoolers, it's also ideal for beginning readers, with simple sentences and minimal vocabulary. 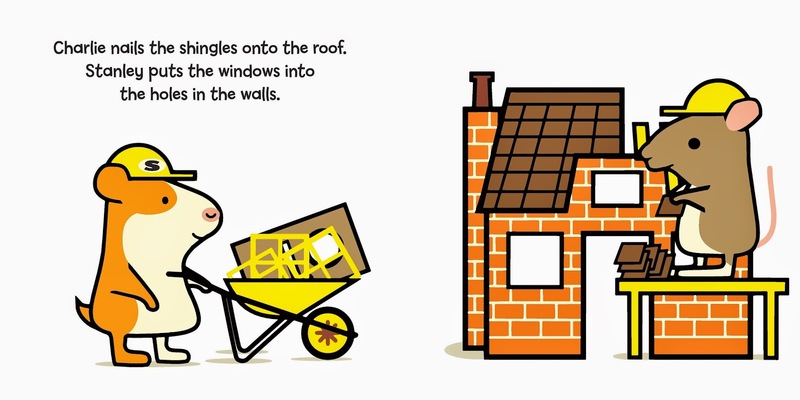 Even with the limited vocabulary, Bee uses correct words for different tools and parts of the house, such as "shingles" for the roof, thus providing a rich use of words for the earliest readers. The book will also allow young readers to practice sequencing, since the steps for building a house are clearly delineated, and they can even re-tell the story using just the pictures as well. I'd love to win a copy of this for my nephew and niece. They are fascinated by construction projects.